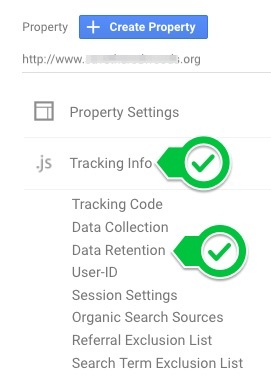 Log in with your Google Analytics password at analytics.google.com, choose your account and click on the orange “gear” icon at the bottom left hand side of the page. This is in the middle column of the admin page. Step 3. Set “User and event data retention:” to 38 months and confirm that “Reset on new activity” is ON and click to Save. – Your data won’t be deleted after 38 months, only a small subset of your data that could be used to identify individual users will be affected.Â Standard reports in Google Analytics will not be affected, while some advanced segments and custom reports will see gaps in data older than 38 months. – Setting the “Reset on new activity” to “On” means that every time someone revisits the site their data is stored another 38 months – you will only lose data on people who haven’t visited your website in more than 3 years. -Â This change is connected to new regulations on data collection from Europe coming into effect on May 25th, 2018, called the General Data Protection Regulation or GDPR for short. 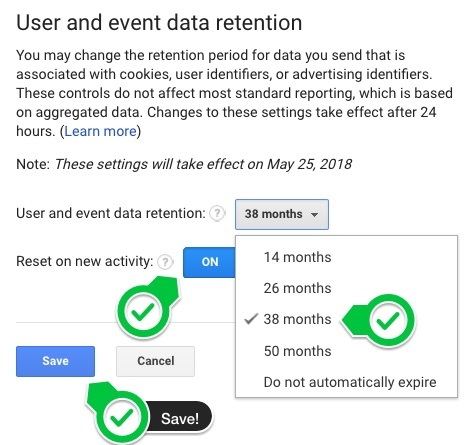 Here’s a great plain-language post “New Data Retention Policies in Google Analytics” from Krista Seiden’s blog. Posted in Google Analytics and tagged by Admin Person.